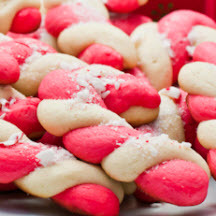 A whimsical, fun-shaped cookie to delight young and old during the Christmas holiday season. Combine candy and 1/3 cup granulated sugar in a small bowl, mixing well. Set aside. Cream shortening and butter in a large mixing bowl; gradually add 1 cup powdered sugar, beating until light and fluffy. Add egg and extracts; beat well. Stir in flour and salt until just mixed. Divide dough in half; tint half of dough with food coloring. Shape tinted and plain dough by teaspoonfuls into 4 1/2-inch long rolls on a lightly floured surface. Place a tinted and a plain roll side by side; carefully twist together. Curve one end down to resemble a cane. Repeat procedure with remaining dough. Place cookies on ungreased baking sheets about 2-inches apart and bake for 9 minutes or just until edges begin to brown. Transfer cookies to wire rack to while still warm and immediately sprinkle with reserved peppermint candy/sugar mixture. Cool completely. Nutritional Information Per Serving (1/36 of recipe): 118.1 calories; 42% calories from fat; 5.6g total fat; 14.2mg cholesterol; 72.5mg sodium; 12.3mg potassium; 15.9g carbohydrates; 0.2g fiber; 9.3g sugar; 15.7g net carbs; 1.1g protein.